Barnt Green concert will be a treat for classical music lovers. Barnt Green will enjoy the sound of orchestral music on July 5 when the renowned Sinfonia of Birmingham performs a concert at St Andrew’s Church, featuring several musicians from the immediate area. Founded in 1993, the Sinfonia has established a reputation as one of the region’s leading chamber orchestras and performs a wide variety of classical music in Birmingham and the West Midlands area. Although the orchestra employs a professional conductor and leader, many playing members have careers outside the sphere of music. Some members are also music graduates from the Birmingham Conservatoire intending to pursue a career in music. The Sinfonia of Birmingham has close ties with the City of Birmingham Symphony Orchestra (CBSO), and many of the principal players from the CBSO have performed concertos with the Sinfonia. Several players, such as Michael Seal, Peter Thomas and Byron Parish from Alvechurch, have taken up the baton to conduct the Sinfonia.Michael Seal also conducted the orchestra on its highly successful tours to the Rhineland, Tuscany and the Netherlands. Concerto opportunities have been provided for many young musicians, including members of the orchestra, to assist them in furthering their musical careers. This concert will be on home turf for members such as Olivia Goodborn, who lives in Barnt Green and teaches cello and piano in the Worcestershire area. She is also a trainee organist for St Andrew’s Church and St Michael’s Church in Cofton. Colin Butterworth, the Sinfonia’s treasurer, runs his own investment business and is a travel writer as well as playing the trumpet. He lives at Lydiate Ash, as does bassoon player Sue Peters, the secretary of the orchestra. She now works as a reflexologist but has also taught the oboe, and spent 25 years as an independent bookseller. 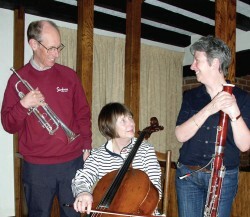 Meanwhile, Alastair and Kathy Moseley live in Bromsgrove and play clarinet/piano and violin respectively. Alastair is a civil engineer and Kathy teaches the violin. The Sinfonia’s professional conductor is Daniele Rosina, who was born in 1979 and began his musical studies in Bournemouth. In 1997 he gained a place at Birmingham Conservatoire, studying clarinet and conducting. While there, Daniele conducted all the major ensembles, giving performances at the Bromsgrove Festival and Symphony Hall, Birmingham. In 2001 he was given a scholarship to study on the Postgraduate Conducting course, for which he was awarded a distinction in 2003, and won the Conservatoire’s conducting prize for four consecutive years. He is becoming a much sought-after conductor in the Midlands. Tonia Price, the Sinfonia’s principal clarinet, will perform the concerto for this concert, as well as taking her place in the orchestra for the other works. Tonia is a music teacher as well as a freelance soloist and orchestral player, and also enjoys composing. She and her husband Gary form the clarinet team for the Sinfonia. The Barnt Green concert, which begins at 7.30pm, features Mendelssohn’s Hebrides Overture, Puccini’s I Crisantemi and Beethoven’s Symphony No 6 (Pastoral), as well as Crusell’s Clarinet Concerto No 2 with solo by Tonia. This programme will also be performed at 7.30pm on June 28 at Holy Trinity Church in Wordsley, when the Crusell will be replaced with Hummel’s Trumpet Concerto performed by Edward Roberts-Malpass, the Sinfonia’s principal trumpet. For tickets to either concert, call 0121 453 2898.